Renewable Energy can help assure Generation Adequacy - Texas State Senator Jos� Rodr�guez spoke at TREIA's June Policy Luncheon on the role renewable energy development can play in the Texas energy mix. He discussed net metering and the importance of delivering reliable energy to meet peak demand. Solar is one of the fastest growing industries in the United States, employing more than 100,000 Americans across all fifty states. 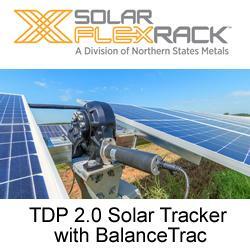 06/29/12, 05:23 AM | Solar & Wind | Schletter Inc.
Schletter's FS ECO™ is an all-steel ground mounted system, based on the company's renowned FS System™. The new system incorporates decades of engineering expertise to create a dynamic, cost-effective steel mounting system for improved bankability and risk management. These online training programs are individually tailored in three professional tracks focusing on the knowledge needed for installation, sales & business development, and engineering & design professionals. With oustanding PV-ezRack SolarTerrace I–B ground mounting system, Clenergy earns the 40MWcontract for a a million-kilowatt PV power station in Jiayuguan, China. Clenergy team work hard to make sure the new plant project in Jiayuguan gets a smooth installation and efficient after-sales service. The Chinese government recently bestowed a National High-Tech Enterprise Certificate to Clenergy. This Certificate marks another milestone in Clenergy's journey towards long-term success in the international PV market. Electrical contractor, Baker Electric Inc., is pleased to announce its 400th Electric Vehicle (EV) residential charging station installation. PV*SOL® basic 6.0 complements the existing PV*SOL® programs from Valentin Software. It is a practical tool with an attractive modern interface and new intelligent inverter design for PV systems planning for one and two-family houses. The country has agreed to cap solar power installations at 52 GW. German Chancellor Angela Merkel's government won agreement on cuts to solar-power subsidies and plans to store greenhouse gases underground, breaking a deadlock that threatened to hold up the country's energy transition. Under the deal reached with Germany’s 16 states in a panel of arbitration, the government will maintain a solar “growth corridor” of 2,500-3,500 megawatts a year, Environment Minister Peter Altmaier told reporters in Berlin late yesterday. There will be a cap on subsidies at 52 gigawatts (GW), at which point a new formula will be found, he said. A new category will subsidize mid-size roof systems of 10- 40 kilowatts at 18.5 euro cents ($0.23) per kilowatt/hour, higher than planned, the upper house of parliament, where the states are represented, said in a separate statement after the panel met. Otherwise, new installations will be subject to subsidy cuts from April 1 as envisaged, it said. ReliOn has delivered more than 4.3 megawatts of fuel cell products to customers in 42 U.S. States and 34 countries.